With me it looks as if shaker cards were only good for this one occasion: it’s another baby card, featuring an image from Bugaboo Digi Stamps. I wonder when my Christmas mania will take root there as well. But for the time being I’ve run out of transparents. Überhaupt hatte ich gestern den totalen Lauf… acht Karten sind dabei rausgekommen. Doch dazu ein anderes Mal mehr 🙂 Diese gebe ich in die Challenge bei City Crafter, wo es darum geht, Pailletten zu verwenden. Habt einen schönen Sonntag! 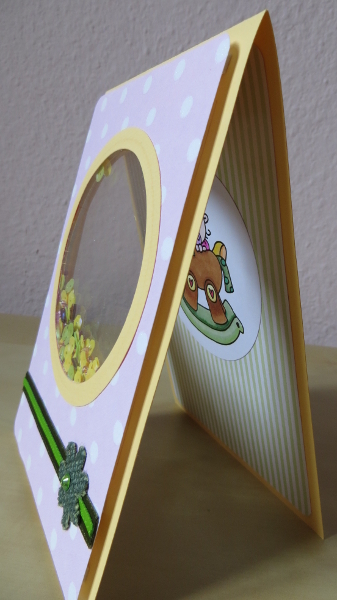 I was on a roll yesterday… made eight cards. But more about that some other time 🙂 I will enter this at the challenge over at City Crafter, that’s all about sequins this week! Have a great Sunday! Aus dem Urlaub zurück und schon wieder so kreativ.super ! Dir auch einen schönen Sonntag in der kühlen Heimat. 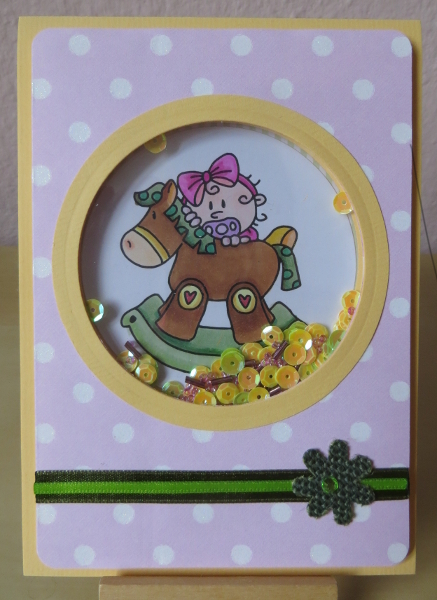 A cute and gorgeous shaker card, You nailed our theme!Thanks so much for joining us at CCCB! Terrific shaker card!! Thanks so much for playing along at CCCB!! Very nice. I’m trying to get on the Shaker train, just not enough time! I need a rainy day! This is so cute, Barbara. Loks like you mastered the shaker technique and I love that your shaker element is in a different layer. If you don’t have any transparencies, you could try using some acetate packaging from your crafting supplies. BTW, did you use your Copics on this card? If you still want to take the OCC Copics class (or want a chance to take it for free), you should check out Kathy’s blog at The Daily Marker for a discount code and/or a giveaway. Of course, you’re also welcome to join Kathy’s 30 day colouring challenge. I have missed so many of your latest posts-for some reason they are not showing up in my daily Blogger window? will go any check now,dont want to miss any more!